JYP Entertainment has released a photo, with the hint that there's several duet releases incoming. 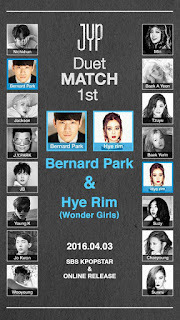 The first duet is Bernard Park & Hye Rim. The photo posted via the company's social media on March 31st, included several artists from the company. 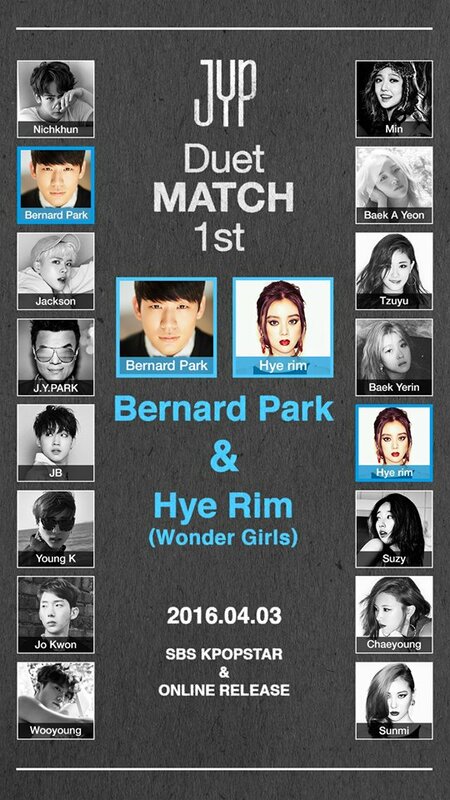 The artists include 2PM's Nichkhun and Wooyoung, Bernard Park, GOT7's Jackson and JB, J.Y. Park, DAY6's Young K, and Jo Kwon. Female artists include miss A's Min and Suzy, Baek A Yeon, TWICE's Tzuyu and Chaeyoung, 15&'s Baek Yerin, and Wonder Girls' Hye Rim and Sunmi. The upcoming duet drops online and via SBS Kpopstar on April 3rd.